Coming up on November 3rd-5th in the serene and autumnal Lan Su Chinese Gardens will be the Ninth Moon Floral Design Showcase. This will be the fourth year of bringing together 25 talented designers from all over the Pacific Northwest, creating unique and impressive displays for the visitors to the gardens. All floral designs will be centered around the chrysanthemum, with displays showcasing more than 75 varieties of the flower for visitors to enjoy. Chrysanthemums are an amazingly long lasting flower. It comes in a huge variety of colors, shapes and sizes. Many people think of them as the fall equivalent of summer dahlias. Chrysanthemums are significant in Chinese culture, the symbolic flower of autumn and the flower of the ninth moon. In several Asian cultures, the Nineth Moon honors ancestral heritage, longevity, purification and the balance of ying and yang elements. Annie Chen, owner of Floral Sunshine, participated in 2014 – the showcase’s first year. Due to scheduling conflicts, we haven’t been able to participate the last couple years, so this is an exciting year! We hope you will join us and all the other participating designers and flower admirers in this upcoming showcase event. More details on Lan Su Chinese Gardens website. and special thanks also to the Floral Design Institute for putting on such an incredible event! October 11, 2017 was Petal It Forward day, an initiative originated by the Society of American Florists to give back to our communities. This event is founded on the concepts of Pay It Forward or Random Acts of Kindness, but we “pay” it forward with flowers! Here’s how it goes: participating florists surprise unsuspecting strangers by giving them two bouquets; one for the recipient to keep and the other to give away as a surprise to brighten someone else’s day. It may surprise you to learn that every state in the nation celebrated this holiday. These events are really fun and make a lot of people smile. And as our name says, we’re all about spreading sunshine with flowers! We had the pleasure of giving away over 150 single flowers at Miss Knockout beauty bar with the help of their staff, and over 50 mixed bouquets in the NW Alphabet District. We were honored to participate in such a unique event and have the opportunity to give a little happiness to our Portland community. Floral Sunshine was featured in an OregonLive article and our owner, Annie Chen, was interviewed on KGW. (See clips below). Awhile back we had a photo shoot at the Portland Yacht Club, to help them get some new images for their marketing materials. Who knew that this photo shoot would be loved so much to be featured on 2 different blogs. Today, we learned that it was featured on Aisle Society. Previously, it was featured on Knotsvilla on Valentine’s Day but of course we were too slammed with Valentine’s orders to make a blog post about it. Enjoy and follow the above links to see more! Floral Sunshine is thrilled to bring something new and beautiful to City Market, located at 735 NW 21st Ave. Since our start in 2009, we’ve focused on high end event design out of our studio space in NW. Now, we bring those non-traditional designs and unique local blooms to an easy to access retail location, with ample parking in back. We will be providing an array of local, seasonal and distinct blooms that you just won’t find in your typical grocery store, plus traditional favorites too. We will offer premade and custom statement pieces you can carry away but will also still offer delivery in the Portland and Vancouver metro areas. Floral Sunshine will begin our new adventure at City Market NW on Thursday, February 9th. We are excited! And hope you are too! Busy day & featured on Ruffled Blog! Floral Sunshine had a super busy day with our usual floral orders, and then we participated in Petal It Forward. We’re members of the Society of American Florists and participated in the #PetalItForward event to show our community the true power of flowers. #PetalItForward is a nationwide event that took place today. We were feeling quite ambitious and randomly spread 70 bouquets in the Portland metro area! It was really fun, for the most part except for the ocassional person who thought we were weirdos! Here’s a local article about the event. After a long day, we found out that we were also featured in Ruffled Blog! Check it out, Meng & Max’s wedding at Bridal Veil Lakes this past summer. We moved!! Leave it to the professionals! We felt super ambitious and moved over the weekend! I know, why so quick and right before Valentine’s Day? Well, behind the scenes – we were in search of a better location for Floral Sunshine for several months and securing a lease takes time… a lot of time. Many times during the process, it felt like the deal wasn’t going to happen – but thankfully, it did! We owe it to our hardworking leasing agent for representing us during the negotiation. We got keys to the new place Thursday evening and had to make a decision whether to move before or after Valentine’s Day. We were so excited about our new space, we really wanted to move in time for Valentine’s Day! We quickly got all our ducks in a row on Friday and the big move happened over the weekend. Even though we moved less than 1 mile away, multiple elements had to be orchestrated in a timely fashion… we were so lucky to have so many wonderful professionals help us make the move fairly quick and painless (except for on the pocketbook). Refrigeration specialists to install the walk-in cooler, plumber to install the new sink, packers, movers, locksmith, handyman (my father-in-law), and my dedicated gold-star employee Meredith! Don’t get me wrong, the move was still challenging but definitely not as challenging since we had these professional services. I really cannot emphasize how important to rely on the professionals to do what they do best and most efficiently. Sure, we could have DIY-ed the move but we would have spent more time and energy – and would probably have been pretty frustrated. It just wasn’t worth it when working with a short timeline. So, please think about this when you or someone you know are planning your next event – hire professionals, they are worth every cent. And btw, if you haven’t ordered your Valentine’s Day flowers yet, you should do that now! Big things are happening at Floral Sunshine! Since our move to NW Portland (from N Portland), we are almost done getting settled into our new studio space and office. We are located right behind Montgomery Park in the Old Freeman Factory (it’s a quirky old warehouse) and we absolutely love the convenience and central location. Among all the exciting things that are happening, the biggest news is that we now have an expanded delivery area! We have an amazing delivery service that specializes in everyday floral deliveries and they pick up from our studio twice a day, distribute the arrangements to their drivers according to their assigned geographical region, and deliver our arrangements with ease! We feel lucky to be one of the lucky shops they service! Bottom line, delivery in the general Portland metro area ranges from $7-12 and Vancouver $15. See below for zip codes and the costs associated with the delivery. Although Oregon City & Gresham are not listed, we do deliver to certain areas so please inquire specifically with the address. We look forward to sending Floral Sunshine your way! Shop now! Floral Sunshine moved to the lovely neighborhood of NW Portland, our new design studio is tucked away in an old warehouse. We are still operating by appointment only, as our schedule is sporadic with meetings (both onsite and offsite) and delivering/setting up events. We are, however, accepting everyday orders in an expanded delivery area, previously it was difficult for us to make deliveries same-day to Beaverton, Hillsboro, Gresham, Oregon City, Lake Oswego, Vancouver, etc… the list goes on… but we now have a new delivery service that specializes in the floral industry! 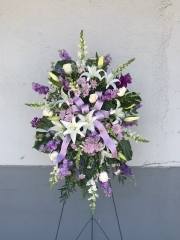 So, please call us to check the delivery cost – if it’s in the expended delivery area – the cost for 1 floral arrangement to be delivered is $7-15. We charge our clients, exactly what the delivery service charges us, there is no additional mark-up. We are excited! Whatever the ocassion – we look forward to talking with you! Give us a call 503-974-4740 or email us and let us know how we can help. Everyone knows that I love creating wedding flowers but hardly anyone knows that I love creating flowers for funerals and memorials. It’s not something I talk about openly and freely because the topic of death/dying often makes people feel uncomfortable and sad. And I can only imagine if I told everyone that I enjoy making memorial wreaths (and large arrangements for memorials in general) – it may freak people out. I think memorial wreaths are so beautiful and glorious. Take a look at this patriotic memorial wreath that I created this past weekend for the reunion/gathering of some of the living survivors of the navy ship U.S.S. Bush that sunk in the 40s. Another one of my favorites from this past summer, using local seasonal flowers like dahlias and zinnias in a vibrant red, orange, and yellow palette. Last but not least, this is a classic memorial wreath of red roses and red carnations. 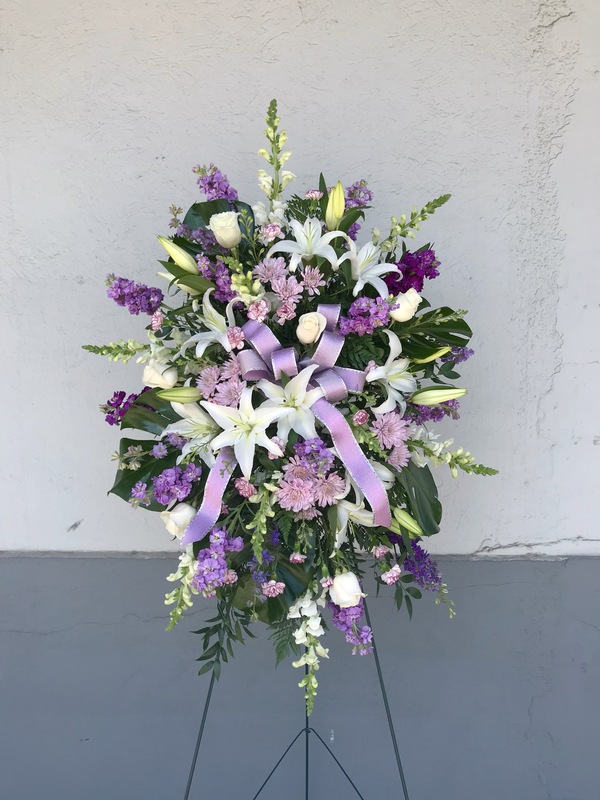 Floral Sunshine makes custom wreaths and all types of arrangements for all occasions, please contact us today 503-974-4740 or fill out our contact form. As the owner and lead floral designer at Floral Sunshine, I am constantly looking to grow, learn some new tricks, pick up new tips, and keep up with new trends. In other words, I believe in continuing education. So when I found out that René van Rems was visiting Portland, I jumped on this opportunity to sign up for his half-day hands-on workshop. Unless if you’re a floral designer, you probably have no idea who this guy is… well, he’s a Dutch floral designer/presenter/consultant/instructor who lives in southern California who has some high floral industry credentials and travels all over the world sharing his talents. I’ve always admired René from afar and own one of his books in my floral library. I have yet to pick up the one below called René’s Bouquets for Brides that was published in 2011. Will you take a look at this crazy-huge-amazing cascading bouquet??? Whoa…. In reality, she would probably be tripping over the trailing portion of her bridal bouquet. So gorgeous and over-the-top, I love it! So, what did I learn at the workshop? I’m not telling! 🙂 I did learn some cool new tricks that help with mechanics and efficiency for wedding flowers.